The Barzebo is the latest ‘must have’ for anyone who loves outdoor entertaining. If you’ve started to see the word ‘Barzebo’ around and thought it was a typo, here’s a run down on the whole Gazebo/Barzebo phenomenon. A gazebo is a roofed, open sided structure, often octagonal in shape. Their main function was (and still is) to provide shade from the sun or rain and a place to rest awhile. They were very popular in public parks and large gazebos were often called bandstands. Gazebos aren’t a new thing. They have received mentions in the ancient literature of many classical civilizations including China and Persia. Having a gazebo quickly became a sign of a person’s wealth or social standing. George Washington had a small octagonal one. Thomas Jefferson intended to build three, all in different styles but only managed to complete one. Gazebos were also called pavilions or summerhouses – although nowadays, summerhouses tend to have at least three closed-in sides and are often like little garden cottages. Why is it called a gazebo? Others say it is from Macaronic Latin – a form of language that was used throughout Europe during the Middle Ages. It used Latin combined with the native language of whichever country it was spoken in. The Macaronic Latin word was gazebo and it commonly meant “I shall gaze” – the gazebo being a place of rest and contemplation. Gazebos were very often used in the Middle Ages. The simplest form was a cloth stretched between four poles and carried by four servants to protect a noble person or dignitary from the sun or rain. Tournaments always featured a structured gazebo from whence the high-born could observe the festivities. 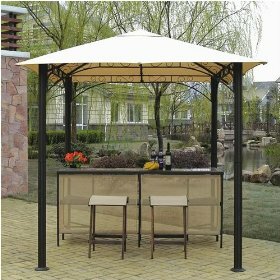 A Barzebo is simply a gazebo with a bar for serving drinks. The Barzebo is strong once constructed but it is also portable. This is extremely useful as it can be constructed in one place and then easily taken down and set up somewhere else. The bar is an integral part of the structure and is joined on to two or more adjacent panels for support. This gives it good structural stability. Like a gazebo, a Barzebo has a roof, often a water resistant canopy which attaches to the structural frame. Some have two tiers for extra protection. The bar area often features glass and bottle holders to keep supplies organized. Some have a separate glass top which sits on the bar surface for easy cleaning and maintenance. Most Barzebos come with at least two and often three bar stools, which most commonly have sling style seats. They vary in size but a popular size is around 6 to 7 feet square of internal space. Price also varies according to the size, materials and ‘extras’ but for one of that size, you’d be parting with around $400. Be careful to check on the delivery cost too as these can be quite hefty. As always, shop around for the best deal. If you live in a sunny climate and frequently entertain outdoors, a Barzebo will be a very good investment and will certainly impress your guests!